“Walking Dead” Season 8 spoilers below. Sunday’s finale kept to the theme, delivering strange twist after strange twist. First of all, Eugene (Josh McDermitt) seemingly switched sides again after spending a couple seasons helping Negan (Jeffrey Dean Morgan) and the Saviors. During this episode, he rigged the Saviors’ bullets to explode in their guns when they tried to shoot Rick (Andrew Lincoln). It was a turning point in the war, leading to the Saviors’ surrender and Eugene’s redemption. Just a week ago in the episode “Worth,” Eugene, who has been aiding the Saviors since Season 7, was briefly kidnapped by Daryl (Norman Reedus) and Rosita (Christian Serratos). He threw up on Rosita in order to escape and get back to the Saviors. If he was planning on switching sides again, why spit up lunch? Why not just tell Daryl and Rosita, “I’m rigging all the bullets, so it’s cool.” Hmmm. Back to the finale: After Eugene’s show of loyalty, Rick slashes Negan’s throat. But then he makes a speech to his followers and the Saviors, stating that he’s in favor of saving Negan and living together as one. A similar scene happens in the comic books, but if this is the plan, Rick, you might want to shorten your speech, because Negan is still lying on the ground bleeding out. To top it all off, in the most inexplicable twist Maggie (Lauren Cohan), Daryl and Jesus (Tom Payne) are plotting against Rick now. Yeah. They apparently aren’t happy that Rick left Negan alive, so we get a brief scene of them scheming against their former leader. Carl died by tripping and falling. What was even going on this year? After surviving into Season 8 of the apocalypse and getting shot (twice), Carl (Chandler Riggs) died after tripping and subsequently receiving a bite from a zombie. The Season 8 finale began with Siddiq (Avi Nash) trying to explain to Rick how Carl died, and it still doesn’t make a ton of sense. Why would Carl be so careless? New rule: Zombie blood now turns you into a zombie. If you haven’t been keeping up, here’s a crucial Season 8 revelation for you: Zombie blood can turn people into zombies. That’s a thing now. Though this occurs in the comics, the TV show hadn’t established that being exposed to zombie blood in a wound could turn you. In Season 6, we seeRick cut his hand on a blade that’s gone through a zombie ― and he’s totally fine. This year, that all changed. A bunch of people at the Hilltop were hit with weapons covered in zombie blood and eventually turned into zombies. In the apocalypse, the first thing to die off is continuity. Wait, another new rule: Everyone turns into a zombieexceptfor Negan. OK, so you got all that about zombie blood? Good. Now forget that hogwash. 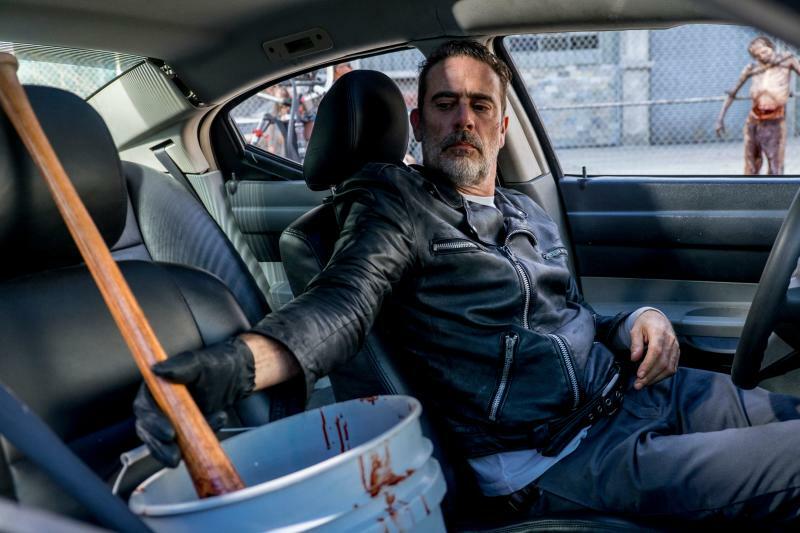 In Season 8, Negan gets in a car crash while riding with a bucket of zombie blood. The blood goes everywhere. He’s totally fine. Then he getshit in the arm with his barbed-wirecovered baseball bat after it’s been smothered in zombie blood. He’s cool after that, too. Who knows why. Just don’t think about it too much. In the “Walking Dead,” Negan talks a lot about people being assholes, so this just seems like a natural progression. 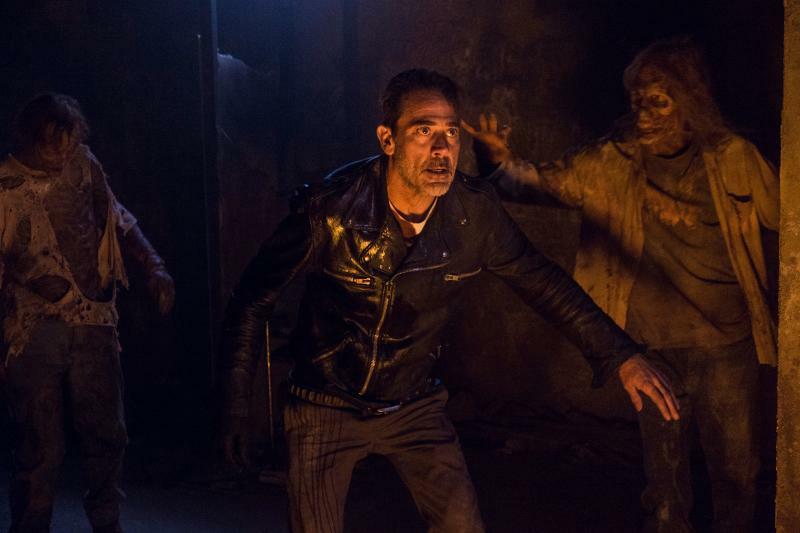 The camera view, which is probably not unlike seeing out of one’s bottom, also makes a brief appearance in Sunday’s finale when Gabriel is trying to escape from Negan in the woods. With so many absurd plot points in Season 8, you can’t blame the internet for being cheeky.